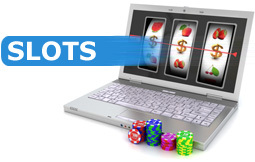 Online slots based on the sea and all creatures that lurk at the bottom of the ocean. 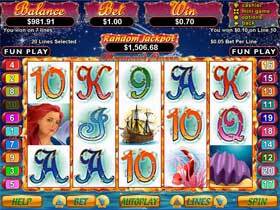 Play slots such as Ocean Dreams Slot, Mermaid Queen Slot, Coral Cash and Mermaids Millions Slot. RTG has recently released an exciting sea themed slot game with doubles, wilds and a free games feature where you can win up to 100 free games. if the player gets 3 or more scattered islands, the free games feature will be activated and all wins will be doubled. The free games can be retriggered and there is an added feature where the wild orca whales are transformed into gold orcas which double the win when they appear. You can also win the random minor and major jackpot on Ocean Dreams Slot. Gather scattered clams from the sea floor to multiply your winnings in winning combinations. With a mermaid’s presence on a winning payline, you double your winnings. If you spot the Mermaid Queen on 1, 3 and 5, 10 Free Games are activated. Each scattered Clam during a Free Game awards you with an extra Free Game. Mermaid Queen Free Games Feature Slot Offers a chance at the Random Progressive Jackpot. 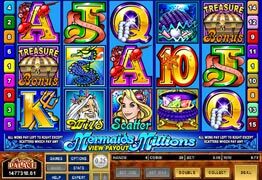 Mermaids Millions has an adventurous sea tale theme, with players able to bet up to 5 coins on each of the 15 paylines. 3 scattered mermaid symbols will trigger the Free Spins feature where all wins are Tripled. The Treasure Bonus feature reveals treasure chests on the ocean floor. There is money inside the chests waiting for you! 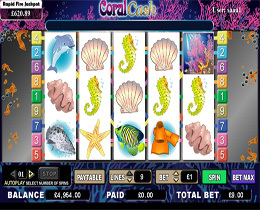 Coral Cash Video Slot takes you into the depths of the ocean, where you will find pearls, colourful corals and starfish. Treasures are scattered all over the ocean bed and are brought to life with the stunning graphics that will appear across the reels. Players will be mesmerized by the display on the screen of the alluring under water scenes in this cute little animated slot game.